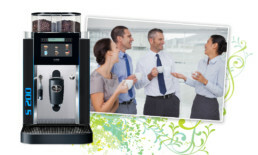 The Rex-Royal S200 Coffee Machine is a great compact machine. Beneath the fine surface are high-quality tested components that work elegantly together. Rex-Royal machines epitomise the best of Swiss quality. Elegant on the outside and powerful on the inside, the S200 from Rex-Royal is a bean to cup machine of the highest order. The machines touch screen offers space to display up to 24 products. This way everything is oriented to the maximum customer benefit and make it quick and efficient in self-service operations. Customisation is a big part of the design, with the ability to personalise the machine with your own label and coloured LED lighting.